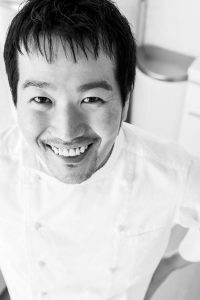 The culinary artistry displayed on NoRecipes.com comes from the mind and creativity of Chef Marc Matsumoto. This blog is where he shares the best versions of the food that he comes up with, whether that be his take on a classic Japanese Chicken Teriyaki, or a modern Italian and Mexican mashup. Marc took some time out of his extremely busy schedule of media appearances, writing, and teaching to talk with Zipangu magazine about all things Japanese food and shochu. Also included are a couple of food and cocktail recipes for shochu enthusiasts. Zipangu: Thank you so much for talking with us, Marc. Can you tell us a little bit about your life and upbringing before you made cooking and education your vocation? Marc Matsumoto: Although I was born in Japan, I spent a fair amount of my childhood travelling between the US, Japan and Australia. I think food is a bit like language in that it helps to be exposed to a variety of culinary cultures at a young age, and there are few melting pots with a more diverse culinary culture than the US and Australia. Growing up, I loved to eat, but I also had a passion for technology and I got involved with BBSs (a precursor to the Internet), before going to work for the first ISP in our area during college. After graduating, I worked my way around Silicon Valley before ending up at a small startup called Netflix, which I often joke was my MBA education. It was a great company to work for, but after their success, I was recruited to a startup in New York. When I moved to NY I’d only been there a handful of times before so I didn’t really know anyone beyond my co-workers and a few friends of friends. In college, I used to throw dinner parties as a way to meet new people, so I used the same tactic in NY and I’d inevitably get asked how I made a dish. My answer was always “there’s no recipe”, because I’m more of an improvisational cook. I ended up turning that into a blog (NoRecipes.com) where I documented some of the best dishes I came up with. To my surprise, the blog blew up and I found myself working a 10 hour day in tech, followed by another 8 hour night in my kitchen. Zipangu: What caused you to choose to become a chef? Marc: The short answer would be that the success of my blog led to opportunities in the food world, but I think the journey began far earlier than that. Some of my fondest childhood memories involved food; whether it was helping my mom in the kitchen, going fishing with my grandfather in the rivers and ocean around my hometown of Kadogawa, or picking daikon with my great grandmother. When I was in high school, I remember having my first taste of tiramisu. It was one of those eye-opening moments, where I was like “WOW, I didn’t know food could taste that good!” I think that’s when I realized that there was this whole world of food out there I hadn’t yet explored, and good food went from a given, to something that should be sought after and perfected. So when No Recipes took off and I started getting requests from private individuals and restaurants to introduce them to my brand of food, the transition from tech to food felt much more natural than it sounds. Marc Matsumoto conducts cooking demonstrations on a regular basis. Zipangu: You have become an international influencer and educator of gastronomy and cooking. Can you tell us about some of the projects that you have been working over the past couple of years? Marc: Unfortunately, part of being a private chef means that my clients value their privacy, so I can’t talk specifics, but I spend about 60% of my time working with private clients, whether they be individuals looking for a few memorable meals or restaurants looking to revitalize their menu. Lately I’ve been consulting with Japanese food and hospitality businesses looking to stay current on trends hitting the US and Europe. Some of these companies are looking to bring new ideas to the Japanese market, while others are looking for help building buzz for their products abroad. Another 20% of my time gets spent on my food blog NoRecipes. com, developing completely new dishes, as well as tinkering with traditional classics to make them better. The last 20% is spent on projects that I enjoy participating in such as making TV appearances and supporting a farming technology that I believe will revolutionize the agricultural industry over the next 20 years. Zipangu: What are you looking forward to over the next few years? Marc: The Japanese food and beverage industry (and by extension all related industries) has long been insulated from the global market. With the mainstreaming of Japanese food abroad and the declining population in Japan, these industries are looking for opportunities abroad with a new-found urgency. I’m hoping to use the influence and experience I’ve garnered over the years to help the Japanese food and beverage industry as they expand abroad. I also want to contribute towards solving some of the most pressing issues of our generation, like how we’re going to sustain the nearly 10 billion people that will inhabit the earth by 2050. Zipangu: Can we talk about shochu a little bit? Have you conducted any events or projects specifically related to shochu or Kyushu cuisine before? Marc: I’m an avid fan of shochu and firmly believe it has a ton of potential on the global premium spirit market. Unlike sake, which has enjoyed mainstream success, shochu is still an undiscovered hit and I relish every opportunity I get to introduce new people to it. 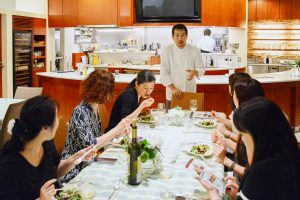 Recently I partnered with Japan Sake and Shochu Makers Association (JSS) to educate Japanese cooking instructors about the merits of pairing shochu with food, so that they can spread the word to their visiting students from around the world. 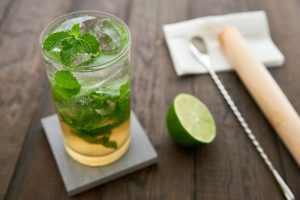 Matsumoto made a kokuto shochu mojito for us to enjoy! Zipangu: What do you see as shochu’s biggest selling points? Marc: First of all, people love a good story and shochu has a long and colorful legacy as the distillation process worked its way up from Southeast Asia through Okinawa and then into Kyushu before spreading all over Japan. On top of that, the breadth of flavor profiles due to the preservation of aromatic compounds, especially when shochu is vacuum distilled. Shochu is sometimes called “Japanese vodka”, but it would be more accurate to compare it to vodka, brandy, whiskey, rum, and tequila because the flavor can vary so much depending on the ingredients that are added to the primary and secondary mash. And of course shochu pairs well with food because its alcohol content hits a sweet spot which allows it to cleanse the palate without numbing your taste buds. Zipangu: What are some of the challenges that shochu faces as it tries to create or enter new markets overseas? Marc: Well, I think it’s the usual David and Goliath dilemma. On one side you have a lot of small producers of shochu with very little experience on the international stage trying to promote a new genre of spirit, and on the other, you have a lot of entrenched competition representing better known spirits with massive marketing budgets. It’s nothing that can’t be overcome, but you add in the language barrier and cultural differences and it’s an uphill battle for sure. 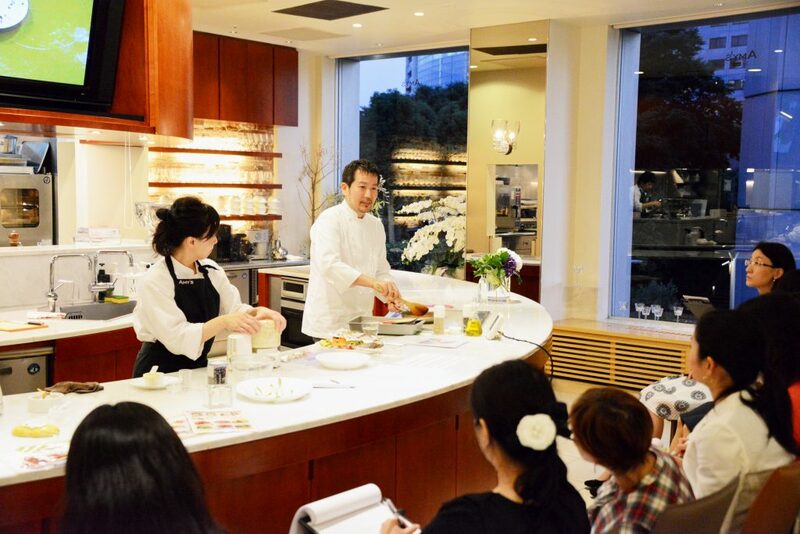 Matsumoto leads guests through a tasting of his original recipes. inroads in the North American market? Marc: The craft cocktail scene is going mainstream in North America, so I think there’s a huge opportunity to promote shochu as a flavorful base spirit for cocktails. Since shochu is often diluted down to 25% ABV, it can be a bit tricky for mixologists to add into their repertoire, but low ABV shochu can still be mixed, and undiluted shochu (genshu), would fit right in alongside vodka and rum. Also, with the nearly universal respect that Japanese whiskey has been getting lately, I think there’s a receptiveness to other Japanese spirits that wasn’t there before. Twenty years ago, no one had heard of mezcal, and bourbon was a drink for drunkards and rednecks, but now they’re top-shelf staples, with artisanal brands popping up all over North America. With its Japanese lineage and broad palette of flavors I think shochu is perfectly poised to become the next hot premium spirit. Zipangu: What are your favorite ways to enjoy shochu? diluting it just enough to take the sharp edge off. Sometimes when it’s very cold outside, I enjoy having my shochu oyuwari, which means it’s cut with hot water. The hot water warms up the shochu, releasing its aromatic compounds. This is a great way to enjoy fragrant varieties of shochu such as imo (sweet potato) or kokuto (brown sugar), and it will warm you up from the inside out. Shochu pairs so well with food because it’s potent enough that it makes for a great palate cleanser, especially with oily foods, yet it’s not so strong as to cover up the flavor of the food. Shochu is also a relatively neutral spirit, so unlike wine it’s almost impossible to make a bad pairing, yet like all food and alcohol pairings, when you do a good job pairing the nuances of the shochu with the nuances in the food, it makes both the food and drink taste better. Zipangu: Thank you so much for your time, Marc. And thank you for helping to spread shochu’s story overseas! Follow Marc Matsumoto on Twitter and Instagram. **This article was reprinted with permission from Zipangu Shochu Magazine. The original article can be found here.